A stately home that has all personalities covered. It’s both close to beach access and tucked in the trees. There’s a master on the first floor overlooking the pool, with a wooded area that gives a sense of privacy and seclusion (a closed road which Folly Beach has no plans to open.) Another master on the second floor overlooks the ocean. Three levels of decks and porches face the Atlantic, so you can catch fresh ocean breezes and taste the salt air, whatever floor you’re on. 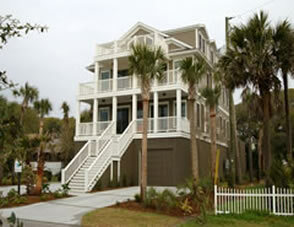 Classic details inside and out insure your time here makes the most of “all seasons” in Folly Beach, South Carolina. 2nd row beach home with close beach access. Approx. 4,500 square feet HVAC. Expansive porches and decks to take in the fresh air. 5 bedrooms, 7 full and 2 ½ baths. Media room/study on first floor. Two laundry rooms, both downstairs and up. Fireplace with gas logs in living area. Heart pine floors throughout first two floors. Tile in all full baths. Ceiling fans throughout, to create indoor breezes. Custom cabinetry by Signature of Charleston. Upscale kitchen including Sub-Zero 48” refrigerator/freezer. Double ovens. Double dishwashers. And an island, of course. Wainscoting throughout living areas, up the staircase and onto the second floor. Plush-carpeted third floor offers a playroom with vaulted ceiling, a family room with microwave, refrigerator/ice maker and wet bar. Four-stop elevator with telephone and security features. 24 x 14 foot in-ground pool surrounded by approx. 1400 sq. ft. of deck with decorative pavers. 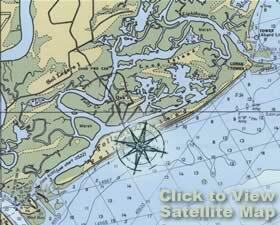 Extensive Lowcountry landscaping. Fully irrigated, automatically.